The addition this week of Karl Kwok’s 80 foot maxi Beau Geste to the Club Marine Pittwater to Coffs Yacht Race starting line-up is the event’s first big boat entry for a number of years, and a very real threat to Wild Oats IX’s longstanding course record. For twelve months Kwok and his campaign manager Gavin Brady were running a busy two-boat program with the Botin 80, built and based in New Zealand, and Team Beau Geste, the unbeatable TP52 that delivered Kwok and his crew the prestigious Audi IRC Australian Championship class A title at their final event at Hamilton Island in August. 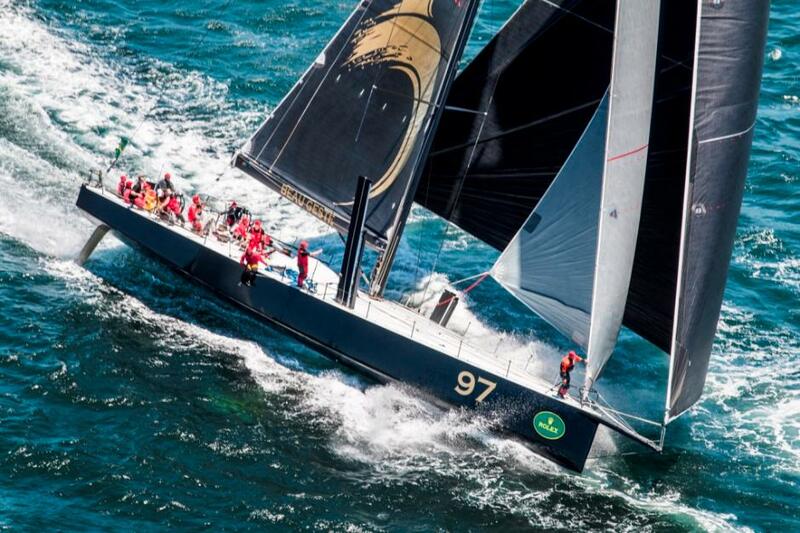 The TP52 is returning from Hong Kong for new Australian owner, South Australia’s Geoff Boettcher, leaving Kwok and Brady to focus on the maxi Beau Geste, the moniker Kwok gives to all his boats. Brady was originally pressing the program to make the Rolex Sydney Hobart start line on Boxing Day, but the owner’s family commitments at Christmas mean the Pittwater to Coffs race is a better option. “Karl has always jokingly said ‘why don’t we do the Coffs race? It goes north and has nice weather’, and the timing is very different,” says Brady. “It’s a big commitment for the guys from overseas to spend Christmas day in a hotel room without their families before the Hobart. Another first time entry, though at the other end of the design and age spectrum, is Peter Moran’s 50 year-old classic Ron Swanson 10.8m design called Camille, built specifically to qualify for the first Australian team to challenge for the Admiral’s Cup, in 1965. Camille not only made the team that finished second to the British, it was the top scoring boat. Moran became Camille’s custodian a year ago and instructed Colin Beashel and his boatyard team in Sydney to go over it with a microscope and bring the boat up to the required Category 2 safety standard for the new owner’s offshore debut racing for the Gosford Sailing Club. Thirty entries have been lodged for the annual New Year bluewater event including ‘Sir’ Robbo Robertson’s own design called Corrobboree, the very first Robertson 950 he built back in 1991. Second round entries close tomorrow, Friday December 12, 2014. Entry is open to eligible monohulls, both fully crewed and shorthanded, and multihulls. The race committee may accept late entries after the 12th. The monohull course benchmark sits at 18hr 29min 14sec set in 2003 by Bob Oatley/Mark Richards with Wild Oats IX (Wild Joe), and Beau Geste is a serious threat to the longstanding record. In January this year Team Australia set a multihull record of 17hrs 3min 5sec and Sean Langman and his crew are returning for the 34th edition starting at 1pm on Friday January 2, 2015 from a line to the north of Barrenjoey Headland on Sydney’s northern beaches. Club Marine, Australia’s largest provider of pleasure craft insurance, is proud to be the naming rights sponsor of the 2015 Pittwater to Coffs Harbour Yacht Race.